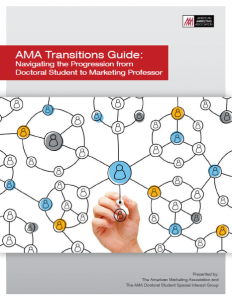 DocSIG is pleased to announce a brand new publication in collaboration with the American Marketing Association and 21 great marketing scholars. Hard copies of the guide will be available at the AMA Winter Educators’ Conference in San Antonio and at subsequent AMA conferences. This entry was posted in Archived and tagged job search, placement on February 11, 2015 by Ashley Goreczny. Thank you for a great 2018 Summer AMA! Thank You for a Successful 2018 Winter AMA!